Before our roadtrip to Germany, Belgium and the Netherlands we were in Frankfurt only at its airport. But this time, we had 2 full days to explore the city at the river Main. But we took it slow, so this is actually a blog post about Frankfurt in one day. 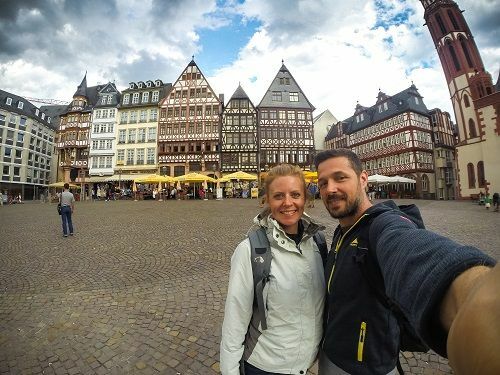 Even though we were exploring Frankfurt for two days, we could do all the things and seen the sights also only in one day. Due to bad weather and my pregnancy, we adjusted the exploration tempo to a little bit slower one. 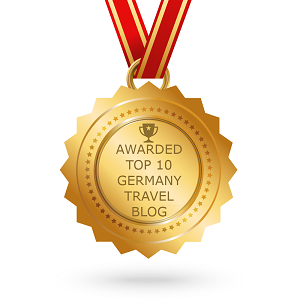 Frankfurt is not a general touristic city. Foreign visitors normally stop at Frankfurt due to business meetings, fairs or a long layover at the airport. That makes Frankfurt perfect as a one day destination. We must admit – Frankfurt is not a city which we would be totally impressed over. Maybe we felt this because its lack of tradition or maybe it was due to bad weather during our complete stay. Or we just did not take enough time for it. One day in Frankfurt after all is really little, for such a big city. But even though we have not fallen in love with Frankfurt, we still managed to find few things, which were to our liking. 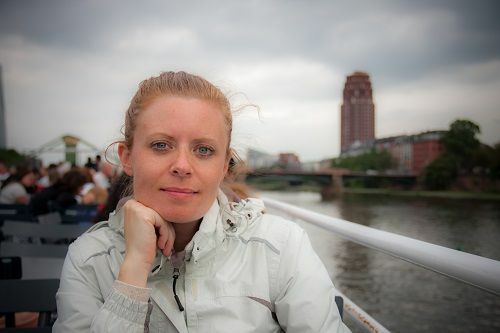 So what to do in Frankfurt in one day? 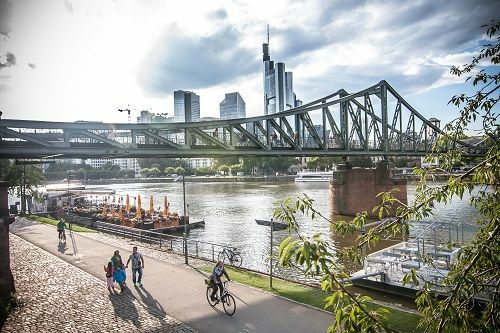 What to see if you have few hours to spend in Frankfurt between business meetings, flights or after a visit to the fair? 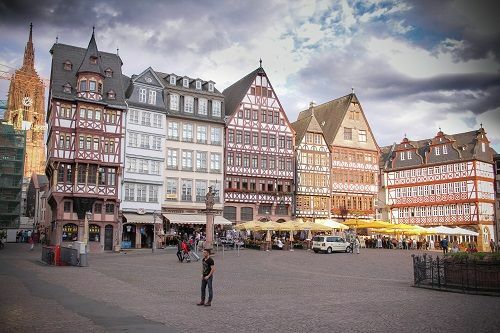 We just love the half-timbered houses there and with them, this was one of the most charming places in Frankfurt. 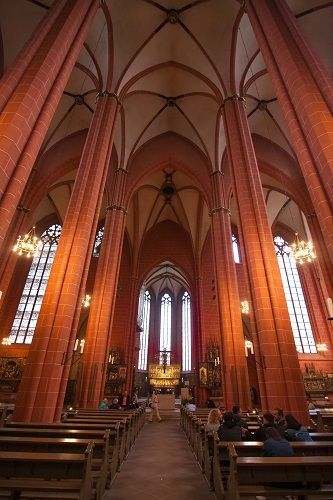 Even though the interior is not covered in gold, but rather plain, Frankfurt’s cathedral is worth few minutes of your time. This is probably the best place for a good night life. There are lots of clubs and bars, offering cheap drinks and bites. Even you will spend only one day in Frankfurt, you have to eat, right? 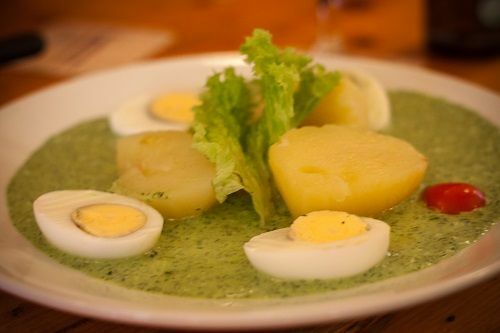 If you’d like to try local food, you cannot leave Frankfurt without its green sauce, made out of seven different herbs, and the famous apple-wine. This electrical-bike taxi is great for one hour long tour, especially if you explore Frankfurt in one day only. 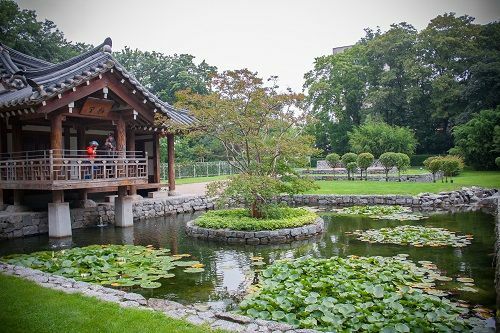 Our tour was more to the greener side of the city, as we were visiting numerous city parks. If you like to see a place from other perspective, you definitely don’t want to miss out on the boat trip on the river Main. 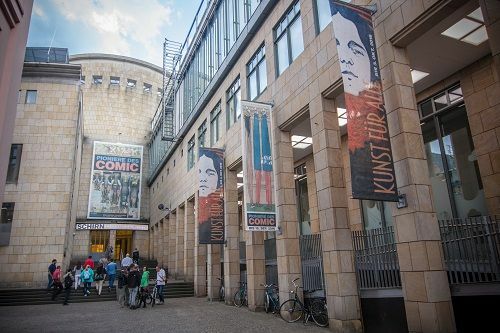 Frankfurt has lots of galleries and museums to choose from. 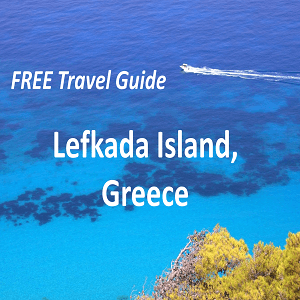 It is up to you or maybe up to the weather, how enjoyable this might be for you. 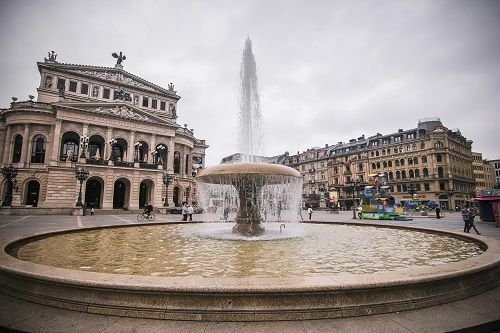 Frankfurt’s city center is a great place for some shopping spree. There are pedestrian streets, full of shops and malls, so save some money for shopping as well. Maybe you can even buy traditional dirndel or leather hosen from a designer Bembeltown (nickname for the city of Frankfurt). 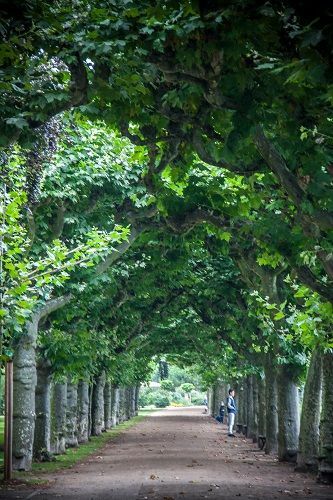 We were really impressed how many beautiful parks can be found in Frankfurt. If you are fed up with traffic, buildings and noise, head up to a park or two. We loved best the Chinese and Korean areas in parks. If we would have better weather, we would definitely spend some more time there. 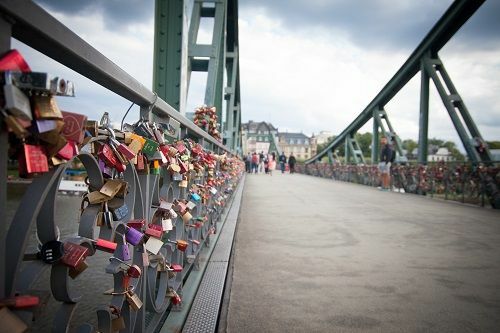 Locking your love at the bridge is becoming more and more popular all around the world and it is no different in Frankfurt. 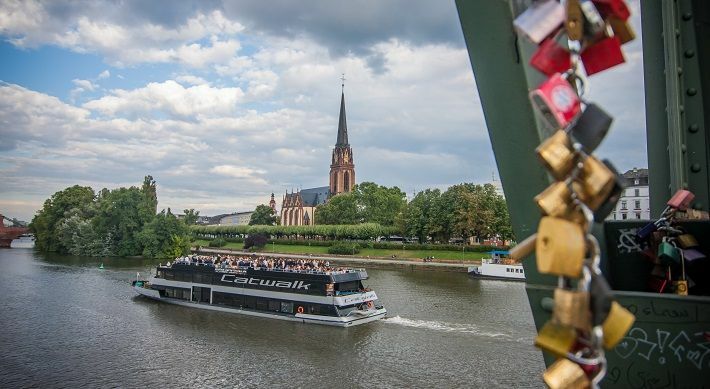 If you have not locked your love yet, you might want to do it in Frankfurt. 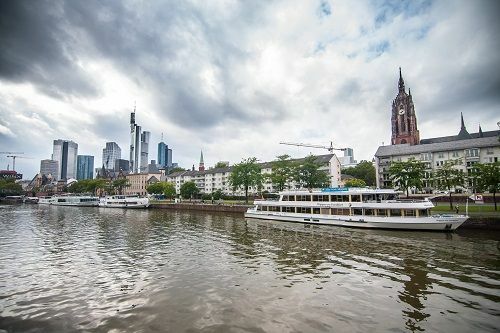 Frankfurt may not impress you like some other German cities will, but nevertheless, if you have one day to spend there, don’t think twice and do it. 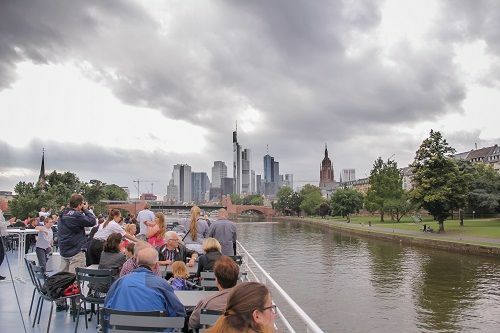 Visiting Frankfurt is also a great way to kill time between long connection flights, as its city center is easily reachable by the city metro / S-Bahn. 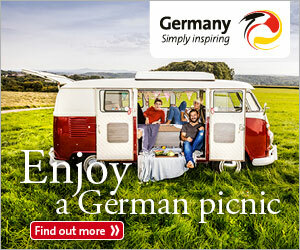 Camping: Frankfurt is perfect for everyone visiting with a camper or a tent. 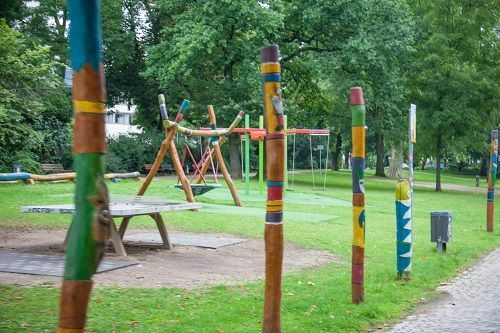 Only 20 minutes ride with the metro line from the city center, you can find the Frankfurt City Camp. The metro station is in its vicinity and so is the grocery store Aldi. (Camping coordinates: 50.09.49.7 / 008.39.02.2). 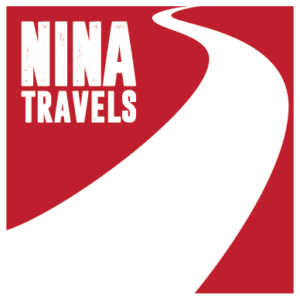 The price for 2 persons, electricity and camper is 25€/night. 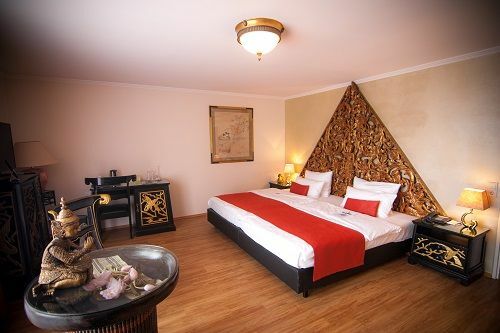 Hotels: The city of Frankfurt has numerous hotels to choose from. 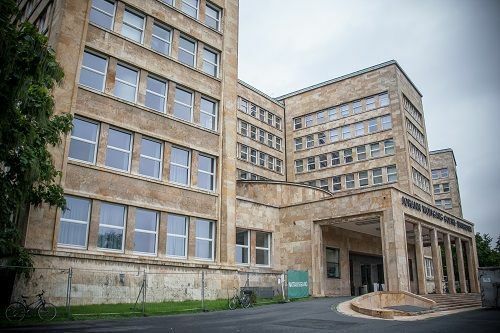 We did not only camp in Frankfurt, but we also spend two nights in a Hotel an der Messe. The hotel has great location for everyone visiting the fairgrounds, which is only 10 minutes by foot from the hotel. There is also a metro station close by, which has great connection to the main train station and city center. Where to eat in Frankfurt? The best traditional restaurants can be found in Sachsenhausen – we ended in Atschel, without knowing it is one of the best. Don’t forget about the green sauce and apple-wine. 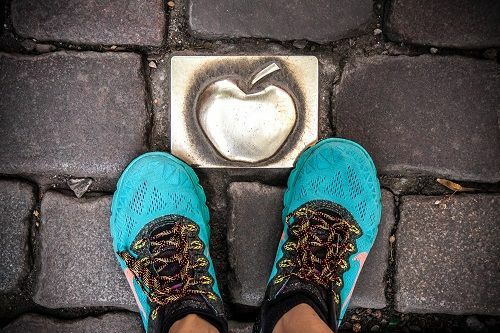 Even if you are in Frankfurt for one day only, you must not skip those. 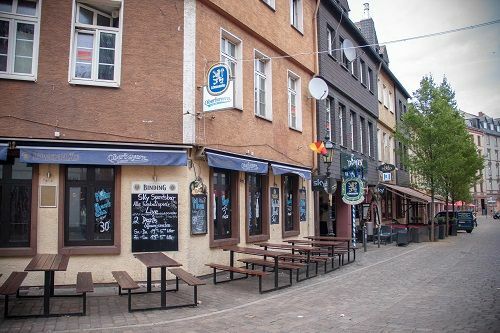 You will also find lots of quick and cheap bites in Sachsenhausen, like pizza, kebabs and other middle east and Balkan food. 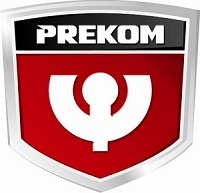 Where to park in Frankfurt? If you will visit Frankfurt for one day only, without staying the night, there are lots of parking garages available. Our 4WD was too high for all of them though, but at the end we have managed to find an open parking space near the fairgrounds and the newly opened shopping mall Skyline Plaza. The price was 5€/day. (Coordinates: 50.06.27.6 / 008.39.15.8). The best way to explore Frankfurt is by its metro (S-Bahn). It is cheap and fast. One day ticket costs 7€/pp or 11€/group up to 5 people. This is wonderful. I am going to Frankfurt soon and knew very little. 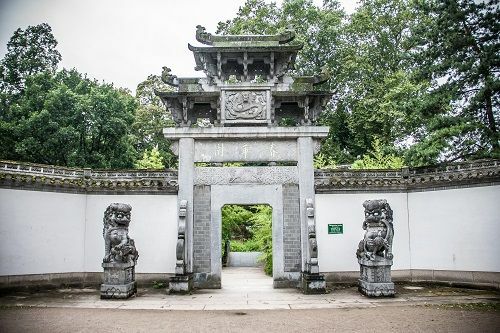 I intend visiting the Chinese gardens, trying the local green sauce and taking a boat trip. Thank you so much for this post! I have recently moved just outside of Frankfurt, so I’ve been looking for things to do when I go there for the day! Not sure about the green sauce though!! 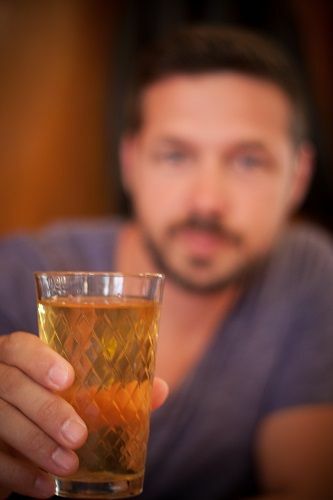 Thanks for this post on the blog. I’ll be a day and a half near Frankfurt in mid-October, and those points are definitely good advice.